Those of you who have been following Wolfpak Decals have noticed that on occasion, they have included a WWII subject or two. The reason you haven't seen more is that many of the schemes available have been done a lot. Finding new ones is not that easy and takes quite a bit of research. However, this is the first of two new sheets that concentrates on WWII subjects and in particular the southwest Pacific. 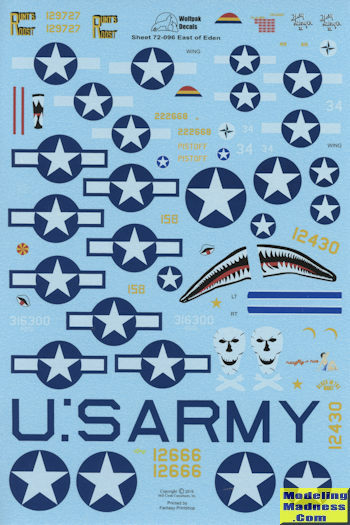 All of these schemes are from units based in New Guinea and all are USAAF. As you would expect from 1943/44 era planes, they are mostly in OD over Neutral Grey. We start with a P-40K flown by Lt. Lee from Dobordura in July 1943. This aircraft is names 'Pistoff' and was with the 8FS/49 FG. This is before the white markings were added to these aircraft. Next is a P-47D flown by Neel Kirby with the 342FS/348 FG. This one was based at Saidor Air Field and does have the white markings. The first of two B-25s is next. This is a B-25D with the 90BS/3BG at Dobordura in late 1943. It has a rather fearsome shark mouth and is a strafer with the additional guns and painted over nose greenhouse. Another B-25 is a B-25H painted overall black. It was with the 318FS based on Wadke Island in mid 1944. 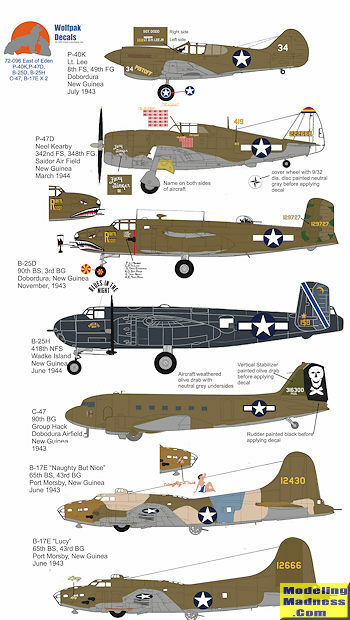 The C-47 is a unit hack withthe 90BG in 1943. It has a black rudder with the units skull and crossbones. The first of two B-17Es with the 65BS/43BG is 'Naughty but Nice'. This one has a rather neat camou scheme of rust brown, OD, light sand, and blue-grey. The other is 'Lucy' in standard scheme. Both from mid 1943.